Ella Valley Winery is located in the valley of Ella in the Judean Hills, which has been a viticulturally important area for 2000 years. While, from an historical point of view, the aesthetically stunning Ella Valley is primarily known for the monumental show-down between David and Goliath; it does have other claims to fame. As with many other Israeli wineries, an ancient wine press was discovered on the site of the winery providing additional visual confirmation that the area had been used to grow grapes and make wine for centuries. If the workers of these ancient presses were to look into what was going on in Ella Valley today, I think they would be very proud of the continued heritage being carried out by the winery resulting in the highest quality of wines possible in addition to enjoying the esthetically pleasing look of the vineyards and the winery. From day one this winery knew what it wanted to be – the very best in Israel, producing high-quality, unique wines. The first vineyards were very carefully planted in 1997 after extensive research as to best location and plots of land and used techniques imported from Napa Valley. The very attractive winery was constructed in 2001 (with the first vineyards planted at Aderet in 1998 and is located on Kibbutz Netiv Halamed Hey in the Judean Hills. Over the last year or so the winery has undergone a number of management changes, the ramifications of which have yet to be seen, but which have the potential to change the winery’s destiny. First, the winery’s long-time, French-trained, winemaker Doron Rav Hon, who has been at the helm since the winery’s founding, left the winery and was replaced by Australian-trained (University of Adelaide) Lin Gold, whose prior experience includes stints at both Tabor Winery and Chateau Golan (non-kosher). Doron’s last full vintage will be the 2010 wines, some of which have already been released (like their amazing Sauvignon Blanc and always intriguing Chardonnay), and others for which we will have to wait (like the 2010 Cabernet Franc, consistently one of Israel best and, together with Four Gates’ version, the best kosher Cabernet Franc wines available). Doron was around for the 2011 harvest, assisting Lin, but the winemaking decisions for that vintage will be all Lin’s and her first wine will be the 2011 Sauvignon Blanc which I have not yet tasted and will be released soon (she is also responsible for the blending of the 2010 wines). It will be interesting to see what she comes up with in a year that most view as a “winemaker’s year” (meaning a vintage in which the best winemakers will make extraordinary wines while the less talented will struggle with the decisions necessitated by a slow maturation followed by periods of rain and cold matched by hot spells). I am also waiting to see whether Doron’s philosophy of making Burgundy-like wines of clean and pure fruit (more in their white wines than red) will continue, or whether Lin’s Australia training will create something new. The second change, which followed a few months after Doron’s departure, was the resignation of Danny Valero as CEO of the winery and who was replaced by Udi Kaplan, the winery’s longtime manager. We will have to see whether Danny’s pet and vintage motorcycle collection remain on location at the winery or whether they find alternative decorative accents. Ironically, the rumor on the street is that Doron’s departure was at least partially a result of Danny who is now gone… We’ll have to wait and see where Doron ends up, but we will most likely be hearing about a new Israeli boutique winery opening up soon, and from which I am sure amazing wines will flow. Only question is whether he will decide to make it a kosher winery (while I am hopeful given his talents, it is more likely to be a non-kosher winery). Given that both Danny and Doron (together with Udi) have been around since the winery’s founding, these are substantive changes. Ella Valley is currently producing around 220,000 bottles annually (with a smaller production of about 150,000 in the 2008 Shmittah year as the majority of Shmittah wines are not exported) with nearly 40% of the winery’s production designated for export. The winery has two main vineyards (which are wholly owned by the winery) both located in close proximity to the winery, with 400 dunam of vineyards at Aderet (located opposite the winery) which is considered the winery’s main vineyard and planted at 350 meter above sea level and approximately 250 dunam in the Nes Harim vineyard planted at 720 meters above sea level and where the majority of white wines and the Pinot Noir are sourced. Despite the fact that their Merlot is among the most interesting in Israel and they make what I feel is Israel’s best Cabernet Franc, the white wines of the winery are extra special with bright clean fruit that is elevated rather than dominated by oak (in the case of the Chardonnays) or manipulation (in the case of the Sauvignon Blanc) while remaining very well priced. Having the winery and vineyards in such close proximity allows for a superior wine making process, providing both the ability to control every aspect of the planting, tending and harvesting and allowing for very minimal time between harvest and the beginning of the wine making process (i.e. fermentation). The approximately 750 dunams of vineyards owned by the winery are so vast that Ella Valley only uses approximately on third of their best grapes, selling the rest to many of the other local wineries (although the winery recently gave up approximately 100 dunam of vineyards located on the kibbutz itself in order to focus on their other premium vineyards). The first vintage was in 2002 and despite it being a relatively poor vintage year in Israel; their first offerings were a resounding success. Starting with the 2003 vintage the winery created its reserve series – Vineyard’s Choice, and is currently producing excellent wines in three series: Vineyard’s Choice, Ella Valley and Ever Red. The winery also produces a private label wine for export – Hai. While the Vineyard’s Choice wines are truly top-tier and world-class, they, like many other top Israeli boutique wineries, carry rather hefty price-tags, especially in the US. The Ella Valley series wines are almost as good and much better priced. While not quite a value winery like Galil Mountain or Recanati, Ella Valley is consistently excellent and it’s a pretty safe bet that anything they make is going to be good (with the caveat that there are many vintages left on the shelves that have seen better days and are now well past their prime). Unfortunately they are not as well known as some other wineries, both as a result of their size and their distribution process, which is truly a crying shame as they produce some of the best and most interesting wines out there and are well worth your time, effort, palate and wallet. While 2010 is considered a potentially problematic vintage in Israel, both Doron and Lin are of the view that it was a spectacular vintage for Ella Valley and the 2010 wines I have tasted so far certainly bear out that premise. Listed below are some of their wines, most of which are available on the US market. For some of their other wines which I recently (and not so recently) reviewed, check out Ella Valley’s page on my website and stay tuned for some to-be-released treats including a sparkling wine and a Vineyards Choice Chardonnay. Also, see if you can find some of the Personal 2008, a special blended wine made by Doron in honor of his departure. I haven’t tasted yet but have heard great things about it. Ella Valley Vineyards, Merlot, 2005: Just another example of how, notwithstanding their magnificent Cabernet Franc, Merlot is what helps set this winery apart from all others. An easy example of a regular series wine that fully deserves to be elevated to their upper-tier Vineyard’s Choice label, but it’s better for us this way since it stays eminently affordable. Muscular, robust, aggressive and bold are not your typical buzz words when talking about Merlot, but those traits combined with the wine’s elegance, depth, richness and complexity make for an absolutely killer combo – give this some time in your glass and it really comes together. Tons of blackberries, raspberries and tangy sharp plums backed by pepper, wood and nice hints of chocolate. A well balanced structure and a long caressing finish loaded with fruit and hints of dark chocolate round this delight out. A wine with the rare combo of being food-friendly and big, bold and powerful. Ella Valley, Syrah, 2007: A wine that can be enjoyed on its own or with food although I prefer it with food. A medium to full bodied intense wine loaded with blackberries, plums, currants and raspberries on the nose with additional hints of bitter citrus peel and earthiness added on the palate. An incredible depth of flavor and nuance throughout with slightly spicy oak, asphalt and more black fruit on the mid palate, leading into a long finish of black forest fruit, graphite and more dark chocolate. While I don’t see the wine getting any better with age it will easily keep for another year or two. Ella Valley Vineyards, Cabernet Sauvignon, 2007: Ella Valley is one of the only Israeli wineries that actually blends their varietal Cabernet Sauvignon with Merlot to punch it up (in this case, 15% of Merlot), but given their incredibly powerful Merlot, it makes sense and the addition does contribute nicely to the final wine, resulting in a rich and voluptuous similar to the Vineyards Choice version reviewed below with a little less retrained elegance. A rich ripe nose of black fruit with some red notes added including cassis, blackcurrant, blackberries and ripe plums, together with some spicy oak from the 16 months it spent French oak (a bit more new oak than the VC wine below), some mineral flintiness, crushed Mediterranean herbs and some bakers chocolate. Much of the same follow the round and mouth filling full bodied palate with plenty more crushed black fruit; toasty oak and slight notes of pleasing greenness all on a solid backbone of robust tannins that still need some time o settle down and play nice. Drinking nicely now, give the wine 15 minutes to open up in your glass first and then enjoy through 2015. Ella Valley Vineyards, Vineyards Choice, Cabernet Sauvignon, 2007: As benefits a true “Reserve” label, Ella Valley only releases a Vineyards Choice wine for vintages it feels will properly honor the label and this Cabernet Sauvignon does so with aplomb. While Cabernet Sauvignon has always been the weakest link in Ella Valley’s tremendous portfolio, they have redeemed themselves with the two versions from the 2007 vintage, both deliciously voluptuous wines, with a primal elegance I found extremely enjoyable. Blended with 10% Merlot and 5% Petite Sirah and aged in 30% new French oak for 17 months, this is a full bodied wine with muscular and silky (near-sweet) tannins wrapped around a juicy core of varietally true dense black fruit including blackberries, cassis and black cherries, together with plenty of toasty oak, a hint of kirsch, pure dark chocolate, oriental spices, a hint of eucalyptus, roasted espresso coffee and some earthy minerals leading into a long and luxurious finish that lingers. Deep, rich and complex, with layers of flavors and nuance, this is an elegant wine with plenty of power. Give this wine another year to develop in the bottle and cellar through 2017, perhaps longer. Ella Valley Vineyards, Cabernet Franc, 2009: Given my public love affair with Cabernet Franc, it will likely not come as a surprise that this is one of my favorite wines from the winery, one I have been following since its first inception in 2003, and one that continuously ends up being one of Israel’s best and easily the one I enjoy the most. The 2008 vintage of this wine was spectacular (see my prior note) and the 2009 vintage is shaping up to be even better with an exceptionally elegant structure and a luscious medley of fruit, wood and green notes. A rich nose of mostly juicy red fruit including raspberries, cranberries and currants together with the characteristically true green pepper and notes of pine (although Doron takes pains to reduce the overt green notes) follows onto a palate of more fruit, spicy oak, near-sweet cedar, cured tobacco leaf and a mineral streak that is starting to become more prominent in many of Ella Valley’s wines. Amazing now, this wine will continue to develop in the bottle and should stick around for 4-5 more years through 2016. Ella Valley Vineyards, Pinot Noir, 2008 (Shmittah): While not every wine I have tasted from the vaunted 2008 Israeli vintage is the superstar some would have us believe, this wine made from 100% Pinot Noir Grapes harvested from Ella Valley’s Aderet vineyard was really delicious and something special. An elegant wine and full bodied (yet so gentle) with plenty of black and red fruit on both the nose and palate including black cherries, cassis and strawberries with some spicy oak resulting from the 16 months in French oak leading into a strawberry and cherry-laced finish with a hint of tannin. Bold tannins that needed some time to settle down in the glass but with a stylish structure that bodes extremely well for the continued development of this wine. In an effort to pamper this fickle grape, Ella Valley actually erected a canopy over the vines to protect from the harsh Israeli sun. I don’t know if it helped but the proof is surely in the wine which is scrumptious. Great now, this wine should cellar nicely for 3-4 years. Ella Valley Vineyards, Chardonnay, 2010: The Chardonnays from Ella Valley are always well made and exiting for their individuality. Doron was one of Israel’s first winemakers to produce an oaked and unoaked version in the same vintage year (a gauntlet Binyamina has now taken up with nice success) and despite their oakiness, many of these wines have a pleasing minerality to them which is somewhat unique among Israeli Chardonnays (although it is becoming less and less rare these days). I believe this is the first Chardonnay made by Ella Valley that went through malolactic fermentation and it consists of grapes from both Nes Harim and Aderet. This wine could still use some time for the wood to recede to the background, but it is very well made with nice tropical fruit and hints of citrus together with a pleasing bitter streak of minerals that promise to come together nicely in about six months or so (avoid overly chilling this wine – it will kill the delightful aromatics and blur the minerals making you miss out on half the fun). A huge nose of aromatic fruit including peaches, apricots, grapefruit and citrus with tart green apple and hints of pineapple on the nose together with toasty oak and some vanilla (just a bit). On the palate more tropical fruit, toasty oak and a mineraly streak present an elegant, round and mouth filling wine. As with the Chardonnay wines from the Golan Heights Winery, I’d give this one another 12 months or so in the bottle before opening and you will be rewarded for your patience with a real Israeli Chardonnay – something to write home about. 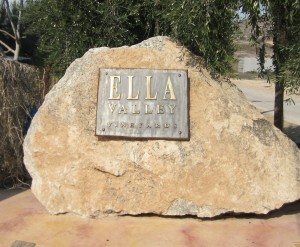 Ella Valley Vineyards, Sauvignon Blanc, 2010: While the 2011 vintage is to be released shortly in Israel, as is common in the United States we are a little behind and the 2010 is our current vintage. Fear not, as it’s quite a delightful and refreshing wine; a good one to be enjoyed with at least the first tease of Spring New York is currently experiencing. Doron’s philosophy has been to make a clean Sauvignon Blanc and not try to disguise it as a leaner Chardonnay and the results truly speak for themselves. Blended with 10% Sémillon (both grapes from the winery’s Nes Harim vineyards), this is a medium bodied wine with pure tropical fruit on the nose, including white peaches, pineapple and cantaloupe together with limes and other citrus notes, freshly cut grass and some minerals and nice acidity on the palate to keep things fresh and lively (despite the label, Lin tells me the wine didn’t see any oak and spent 9 months in stainless steel). At 12.5%, the wine is a nice match to food – enjoy over the next 12-18 months. Ella Valley, Vineyard’s Choice, Merlot, 2004: My love for this winery is well known and their Merlot is really special (although the Pinot Noir, Petit Verdot, Syrah, Chardonnay and Cabernet franc are all spectacular), so I was really happy to get the chance to taste this somewhat mature wine from the winery’s cellar on my recent visit to the winery, which was enjoyed in the company of their new and delightfully charming winemaker – Lin Gold who has replaced the exceedingly talented Doron and I wish her much continues success. A blend of 85% Merlot and 15% Cabernet Sauvignon (all from the winery’s Aderet vineyards) which spent 17 months in French oak. A full-bodied wine at 14.5% alcohol with muscular tannins that have (finally) receded and integrated nicely into a medley of black forest fruit with some red notes as well that. Plenty of rich fruit on the palate together with roasted Mediterranean herbs, cedar, tobacco leaf and a faint hint of baker’s chocolate leading into an insanely long finish. Drinking perfectly right now, this wine should cellar nicely through 2014 (11/11). Ella Valley Vineyards, Petite Sirah, 2007: An extremely limited edition that was only available in Israel, I first tasted this a while back at a wine tasting organized by the Israeli economic mission to the US. I emailed Avi-Ben from the tasting to request a number of bottles which I was lucky enough to secure and a subsequent tasting of this wine only served to validate my opinion of its deliciousness! The first time Petite Sirah released by the winery and, like literally everything else they make, it is a success. Characteristically powerful tannins wrapped around gobs of jammy black fruit including blueberries, blackberries and cassis, together with some cigar box notes make this a wine to contend with. However, all that power is wrapped in an elegant velvet covering making this rich wine somewhat restrained and allowing you to take in all it has to offer. A medium to long finish rounds this one out (11/11).